While we are surpassing 70 degrees in the northeast, I’ve been getting my fill of snow in Forza Horizon 3: Blizzard Mountain. Blizzard Mountain is a content pack that was released last December in the middle of the busy holiday and award season. It was generally overlooked here at OS; maybe you also missed the release of this expansion pack that twists the Forza formula, in many cases, for the better. Blizzard Mountain isn’t just the DLC’s name, it’s also the name of the newest locale you’ll visit while tearing through Australia. And yes, there is snow and skiing in the land down under (don’t worry, I had to check too). Unfortunately, this new area doesn’t really integrate with the main map; you’ll need to catch a helicopter and a loading screen to get to the new zone. That’s a relatively minor quibble, though, as the helicopter first drops you off at the top of a snowy peak, James Bond style. You slide one of the seven new cars down a slalom-ish course before you’re able to open up a new festival location at the base of a winter sports park. One other quirk: You need to be a few hours into Forza Horizon 3 before you have the ability to play this expansion. That’s reasonable, but if you buy both the base game and expansion at once, don’t plan on hitting the slopes right away. Perhaps my favorite thing about Blizzard Mountain, and vanilla Forza Horizon 3, is how different every terrain feels while driving. You know, based on traction and feel, if you are driving on a paved section of road, desert dunes, or sliding through shallow water. Even short engagements with differing terrain have to be taken into account to be successful. This is one of the best elements of the game; l’d even argue no driving game does it better. Blizzard Mountain adds to the mix with a variety of wintry surfaces, all which feel exactly like they should. From snow-covered roads to frozen lakes, maneuvering through these new environments takes precision, patience and practice. Along with the ground, the skies wreak havoc too. Driving through a blizzard, especially at night, makes simply following the course a challenge. This means leading a race can be a disadvantage as you struggle to find the correct path. Keep a finger on the rewind button! 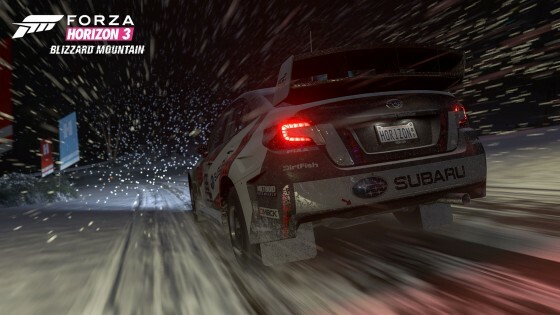 In addition to the elemental challenges, hill climbs and descents are part of the increased difficulty. As mentioned, the expansion throws you into the middle of a descent as an introduction; you quickly learn how little you need to accelerate as gravity and ice help propel you down the mountain. Graphically, this is beautifully represented by increasing greenery and exposed pavement. While Blizzard Mountain itself exists separate from the main map, so does its progression system. Gone are the increasing number of fans — there is little carryover in that regard. Instead, Blizzard Mountain introduces a rather traditional star system. For each event, you can earn up to three stars. The first is for simply finishing the event; the second, for winning; the third star adds some kind of unique objective, including style points, clean racing, etc. I have mixed feelings about this change. I appreciate that it is different from the base game, which makes sense if you have already spent a great deal of time there. But it also funnels you into some rather artificial goals. This can be fun if you are looking for those kind of challenges, but if you are a pure racing fan, maxing out the game by having to switch your driving style can be annoying. Again, the game looks beautiful, showcasing some of the best graphics on the Xbox One (and PC, if you have a top of the line model). 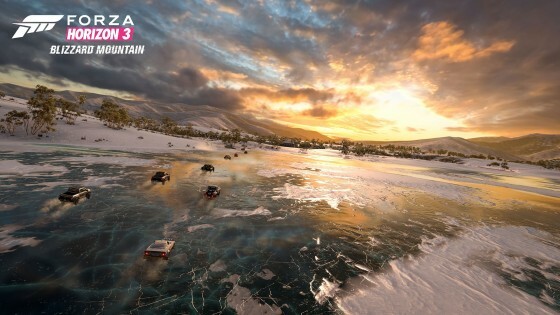 The weather effects, various snow-covered terrains, dynamic skies and car models are top notch. Watching the blowing snow of a blizzard through your windscreen is scarily authentic, especially at night when your lights illuminate the flakes more than the road. If you are a fan of Forza Horizon and feel you’ve done all you can do in the base game, Blizzard Mountain shakes things up in some meaningful ways. New weather, new environments, new race types and a new progression system should reinvigorate your interest in the game. 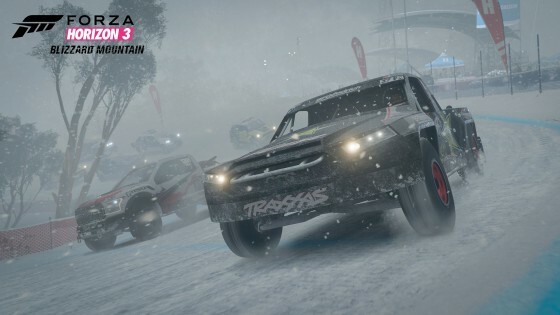 If you aren’t very far into Forza Horizon 3, Blizzard Mountain offers more of a great game, but it can feel a little isolating because not much transfers other than your driver level and cars, which you can now equip with snow tires. It’s not quite as integrated as you might expect. A big question for both types of fans would be of value. For $20, you are getting 50 or so new events, seven cars, a “barn find” car and lots of little ways to increase XP. For $15 more, you can pay upfront for another upcoming DLC expansion. I think this pack is worth the $20. If you have the ability to pay for the pass, you are probably saving $5 on what should be another piece of quality content. And, if you haven’t played Forza Horizon 3 yet, what are you waiting for?